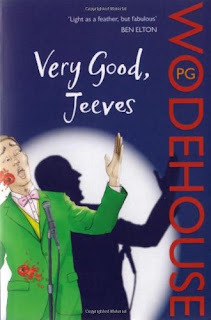 I am a huge Wodehouse fan;have been one ever since i found a copy on our book shelf when I was in school. I find his writing breezy and plots as funny in a geeky sort of way.Not to mention the Brit humor which i totally heart. I tucked into a Wodehouse book almost after five years and found that I didn't enjoy the book as much as I would have wanted to. Very Good Jeeves is a collection of short stories, all featuring Jeeves and his feeble-minded master,Betram Wooster.The 11 stories that appear in the book seemed very similar to each other,with just a few variations in the plots. On top of that the collection contained many stories I've already read, so I wasn't really impressed with the book. Which is a pity!. My favorite stories of the lot were the one about the blighted Sonny boy song and the one featuring the kid Clementia.The rest were quite a let down. Maybe, this had to do with the fact that most of my favourite Wodehouse books have been full-fledged novels and not short stories. Somehow, his style of writing is more suited to a novel ,where the bloopers pile one on top of each other ,until Jeeves makes an appearance finally and puts everyone out of their miseries. The same happens here,but with not much momentum building up,the stories appeared rather weak like a cup of diluted tea ,rather than a pot of refreshing Earl Grey it is supposed to be like. Also,the choice of stories could have been more prudent,with more diverse plots included in the collection. After all, nobody wants to read a Wodehouse book and be content with weak distracted chuckles. Overall a downer. Its not a bad book,mind you. The Wodehouse brand of humor flows freely, but on some level it just fails to excite you as much as some of his other books have. I'll give it a 3/5. My heart bleeds to give a Wodehouse book less than a four,but I'll not be fair if Igave it more than a 3. Why is it that only me can't get into his books at all. Please suggest your favorite, I will give it a try. Surprising considering how widely read he is. You can probably start off with Right ho, Jeeves or Thank you , Jeeves. Wodehouse is read for his style, making mundane or even drab incidents look funny by his choice of words and exaggeration. If one is tuned to it they would love him. Eg. Lord Emsworth saying, "What, what, what" in an apparently serious situation, is enough to crack up Wodehouse fans. TV.. Somehow this book was lacklusture. Maybe his wit didn't sparkle. I remember almost falling off my chair (from laughing) when i read some of his other books .. Yes, Jeeves is at his best in a full length novel. And these collection of short stories sometimes do disappoint; I feel this is just the publisher's ploy to recycle some stories to make a fast buck.